Investing in Real Estate is an important adventure - whether you are buying or selling your first home or 50th. With me at your side, you can make your best real estate decisions. 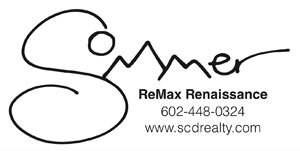 For recent area news and information, check out Sommer's Blog. We try to keep it relevant, interesting, and useful with Market Stats and Trend Updates and other home ownership information. WOW! The Valley market has changed drastically! Most areas are now "seller's" markets and multiple offer situations are common. Buyers can expect to offer at or very near list price to secure a contract on a home. When you work with me, I help you navigate this transactional process, ensure the right disclosures are included, and understand how factors such as appraisals impact the success of a sale. This web site features real estate tools you need when looking at real estate and homes for sale. You can browse exclusive homes for sale, search virtually all area listings through my property search, calculate mortgage payments on your next home with my real estate mortgage calculators, access home buying and selling tips, get tremendous area information about greater Maricopa County including specific information for Tempe, Phoenix, Chandler, Gilbert, Mesa and Scottsdale. Furthermore, you can find out how much your property is worth, and access comprehensive information about selecting me as your real estate agent.